On Thursday 21 March 2013, the European Defence Agency held its annual conference, entitled “European Defence Matters”. European defence experts gathered in Brussels to take stock of what has been accomplished, what the challenges to the common security policy are, and to shape certain concrete actions for the future.During the day, Mrs Claude-France Arnould (Chief Executive of the European Defence Agency), HR/VP Baroness Catherine Ashton (Head of the European Defence Agency) and Mr Herman von Rompuy (President of the European Council) expressed their position; three panels were created to work on different issues. Mrs Claude-France Arnould opened the Conference by affirming its importance as, this year, the European Council will be in charge of discussing defence topics. She highlighted some successful initiatives such as Pooling & Sharing priorities approved in 2011 by Defence Minister. Despite her enthusiasm in favour of an extension of this impetus, she also recalled the importance of a political will to lead an effective common security policy, which remains to be strengthened. In her speech, Baroness Ashton adopted an optimistic position. She pointed out many EU successful actions, in particular in the Horn of Africa as well as in Mali. She affirmed the necessity of a collaborative approach between Member States and the fact that “the EU needs to remain a credible security and defence player on the world stage”. Her main idea in the context of “the biggest economic and financial crisis” is “to do better with our existing resources and capabilities”. According to her, cooperation is the key element to achieve this ambition. President Von Rompuy adopted a pragmatic approach. He confirmed Baroness Ashton’s position by highlighting the question of “how we spend”. He is convinced that defence spending cuts are not the main challenge and stated that the EU and its Member States need to be “clear on what they want” and cooperate to achieve their ambitions. A common action would allow the EU and its Members States to save money as well as to cope with evolving situations. The first panel debated on the following topic “Lessons from Defence Cooperation”. This panel addressed three key issues: What are the prerequisites of successful cooperation? What are the risks and obstacles, which must be addressed to be successful? Where is the need for defence cooperation the most urgent? The second panel was in charge of a discussion entitled “Looking ahead: setting the longer-term goals for European Defence Cooperation”. 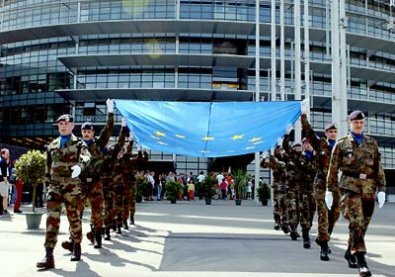 This panel was supposed to highlight difficulties of the cooperation and make propositions to reinforce the European defence cooperation. Finally, the third panel reflected on “European Defence Cooperation: concrete steps for the next year”. This panel was responsible to define “concrete steps for cooperation in order achieve results to better meet the challenges and threats Europe will face in the future”. The work of panels has not yet been released. We are waiting for the conclusions of each panel to determine if relevant progress has achieved during this year’s conference. This entry was posted on 25/03/2013 by ISIS Europe in Conferences and tagged Defence, EDA, EU, EU Mutual Defence, Research and Innovation.